Ulugbek Fayzitdinov Ismonalievich was born in a farmer family. Even in school years he was interested in livestock breeding and therefore helped his parents in their work. The time spent with the animals gave him great happiness and his dream was to continue his parents’ job. After graduating, Ulugbek went to the army. Returning from the service, Ulugbek married and then went to work in Russia to provide for the family. After several years, he returned to his homeland and bought livestock. However, his income was barely enough to cover his family’s expenses. He needed to expand his activity, since his experience in breeding cattle was already excellent. 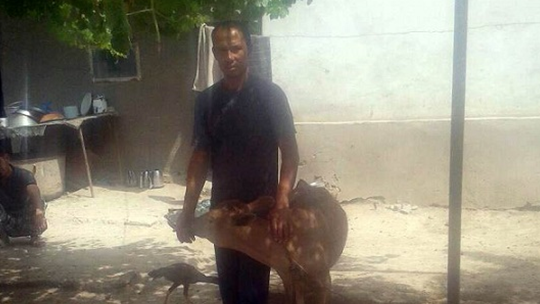 In 2012, he applied for his first Humo loan, for 4000 somoni, to buy two heads of livestock. His activity gradually expanded. He repaid the loan in time and applied for another one. This time he could develop his agricultural activity, buying mineral fertilizers and onion seeds. In that year, the onion harvest was good and he improved his living conditions. In January 2017, he obtained another microcredit from MDO Humo through MicroWorld. He could cheaply purchase cattle again. With the proceeds, he set up his own meat shop, which is an additional source of income. Ulugbek is satisfied with the loans he obtained. He now breeds cattle, grows onions and sells meat. The financial situation of his family has much improved. Ulugbek takes this opportunity to express his gratitude to MDO Humo and MicroWorld lenders for their kind support and help!